North Korea’s recent successful test launch of an intercontinental ballistic missile, and the return of University of Virginia student Otto Warmbier to his family in a comatose state after 14 months in a North Korean prison and his subsequent death, have again heightened public awareness of the global security threat and chilling human rights abuses of the nuclear-armed North Korean regime. Addressing these security and human rights issues, Korean political leaders, U.S.-Korea alliance experts, representatives of the largest Korean grass-roots reunification movement, and the longest serving American held in a North Korean prison addressed a forum, “Building an International Alliance for One Korea: Vision and Solutions to the Korean Crisis,” in Washington, DC on July 18, 2017. 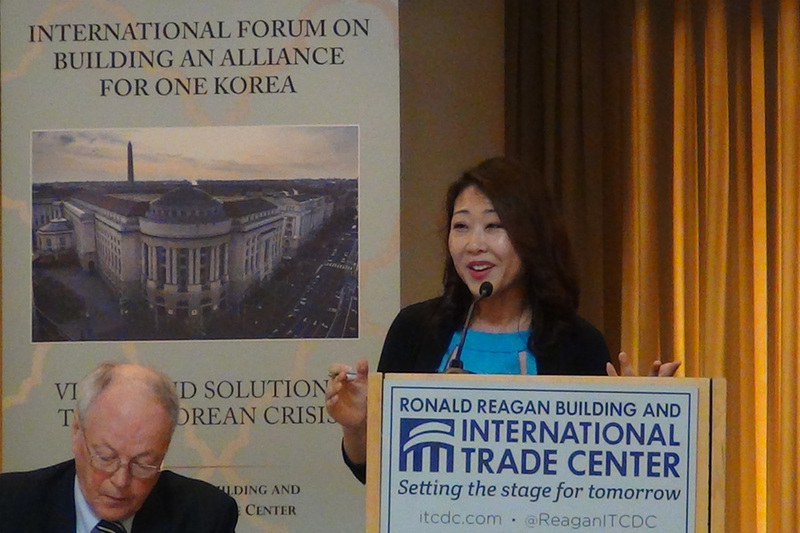 With little progress in decades of diplomatic efforts to resolve the crisis, panelists noted growing support for peaceful Korean unification as the ultimate solution to the threat posed by Korea’s current division. A movement for a unified Korea, with significant civil society engagement, can provide a new framework to answer existing challenges and support the daunting work of integrating two societies that have grown far apart politically and socially over 70 years. In welcoming remarks from representatives of the co-convening organizations, Dr. Jai-poong Ryu, President of One Korea Foundation (OKF); James Flynn, President of the Global Peace Foundation (GPF); and Inteck Seo, Co-Chair of Action for Korea United (AKU), likened the Korean crisis to other transnational challenges, such as threats to the environment and extremist violence, which require concerted global action. The Korean division is a vestige of the past, the speakers noted, a Cold War conflict that must be resolved internationally, much as the apartheid government of South Africa came to an end peacefully through domestic and international pressures fueled by people power. Reflecting on the ancient Korean ethos of Hongik Ingan, or “living for the benefit of humanity,” hosts said that Korean unification defined by such an ideal can also be an example globally. In a lead address, Jong-Kul Lee, a senior lawmaker of the majority Democratic Party in the Korean National Assembly, cited a Politico poll that found that some 40 percent of Americans ranked North Korea as the greatest threat to U.S. security, followed by ISIS. The Korean lawmaker then presented a wide-ranging assessment of the North Korean threat and summary of the Moon Jae-in government’s policy toward the North. Lee noted that the previous “Sunshine Policy” aimed at reducing tensions and fostering good will and internal reforms has not led to such outcomes, particularly in light of the expanded nuclear program in the North. Lee further discussed strategic responses, in coordination with the United States, to minimize the nuclear threat, and urged a far more robust deterrent capability through the reintroduction of U.S. tactical nuclear weapons and submarine-based defenses in the South. Dr. Hyunik Hong, a Senior Fellow at the Sejong Institute in Seoul, expressed a more sanguine outlook on relations between the Koreas. Noting that President Moon has said that peace is more important than unification, Hong urged that the first object should be the stabilization of peaceful relations on the peninsula. 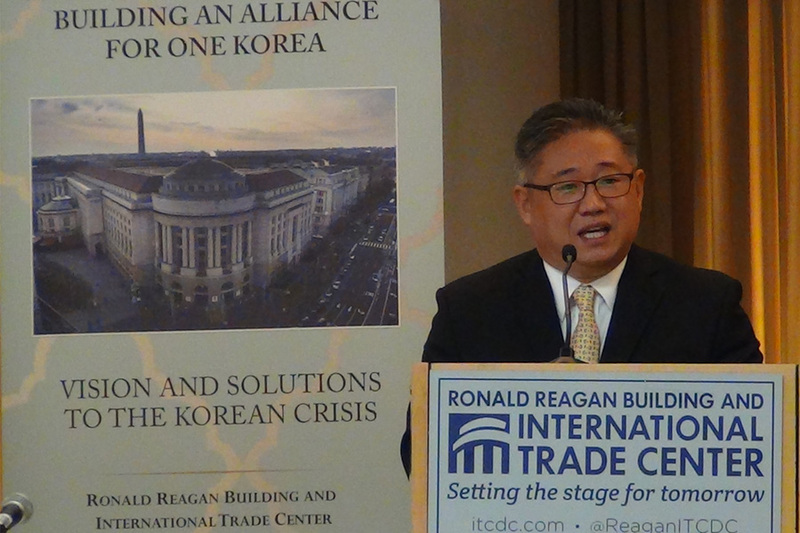 Given that the South Korean economy is roughly 40 times greater than North Korea’s economy, Hong said that sustained peace can lead naturally to unification. Also acknowledging complex security concerns in the region, Hong said that in the northeast Asia region “if we create a common security structure unification will come naturally.” Further emphasizing the importance of humanitarian aid and respect for human rights, Hong noted that the Moon government has authorized initiatives to promote peace and dialogue. Offering a response to the Korean policy experts, Joseph A. Bosco, a Senior Fellow at the Institute for Corea-America Studies (ICAS) and former China Director in the Office of the U.S. Secretary of Defense, sharpened the distinction between the types of unification envisioned by the North and South. Recalling the attempt at forced reunification when the North invaded the South in 1950 to begin the Korean War, Bosco said the Republic of Korea, Japan, and the United States should seek “a reunified democratic Korea governed under the rule of law,” in contrast to the regime in the North that denies basic human and political rights to its citizens. 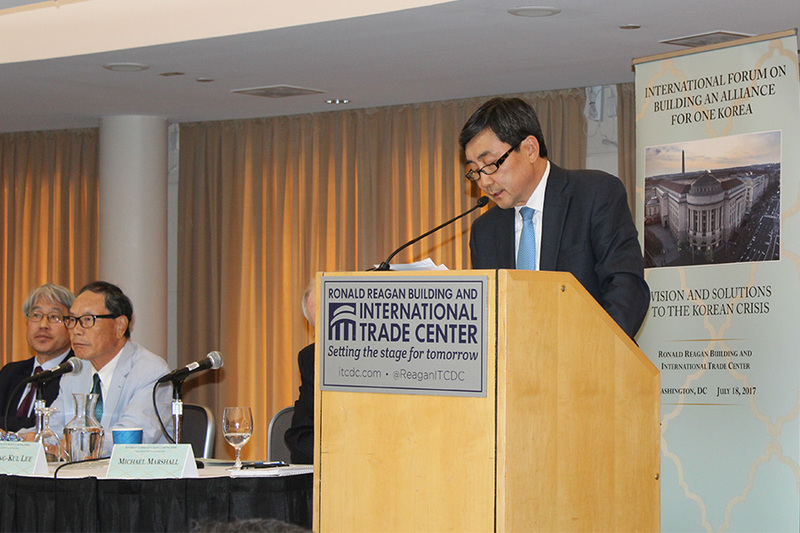 “The key today, as it has been from the beginning, is the critical role played by China,” Bosco said. “China bears an enormous responsibility for helping to create the perilous situation confronting South Korea, Japan, and the United States.” Bosco urged policy makers to realistically acknowledge China’s ongoing support for the North Korean regime and advance policies that can more effectively deter North Korean aggression. She cited examples of a relief organization which is digging wells to provide safe drinking water; and another mission worker who saw young girls who were using leaves for sanitary napkins and created a factory to provide fabric napkins. Compassion International also has developed curricula to teach young North Korean leaders in the event of unification and is testing it with defectors. Bae realized that Christian renewal was likened to a virus, an infection that causes loss of faith in Juche ideology and the regime. Yet in prison he talked to many guards who began asking him questions—How much did he earn? Did he have a car? And in private they would ask personal questions about their families and relationships. The final speaker, Dr. Richard Bush, a senior fellow at the Brookings Institution and co-director of its Center for East Asia Policy Studies, explored the recent reunification of Germany and Vietnam as a way of anticipating the challenges facing Korea. While strongly supporting “the right kind of unification,” Bush noted that the Korea division is much longer and differences outweigh the similarities. He said there is a “profound economic and social gap” that exceeds the examples of Germany and Vietnam. Germany for example spent some $1 trillion to underwrite the unification. Yet East Germany had a lower population than North Korea. East Germans could also meet with relatives and travel with restrictions, with some 3.5 million East Germans migrating to West Germany prior to 1989. North Vietnam had a command economy but a large agriculture sector. 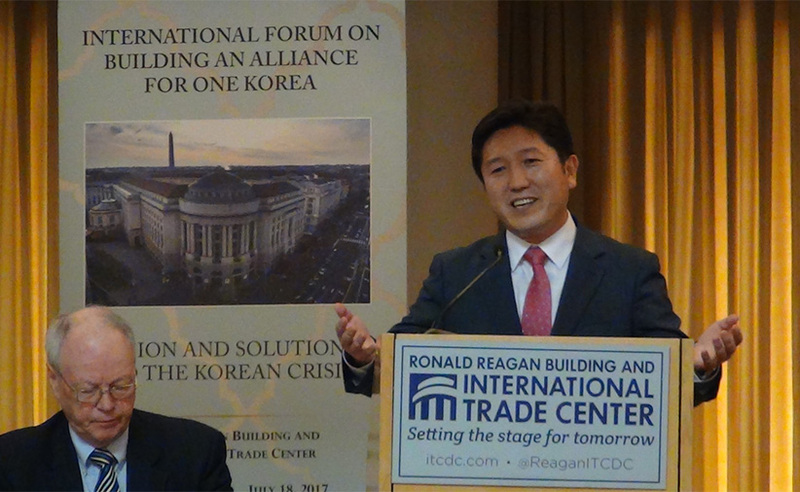 In addition to co-conveners AKU, OKF and GPF, the forum hosted at the Ronald Reagan Building and International Trade Center included support from the Republic of Korea Ministry of Unification, the National Unification Advisory Council, the Global Young Leaders Academy and Korean Churches for Community Development.